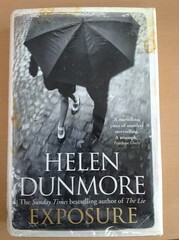 I almost gave up on Helen Dunmore’s Cold War novel. I didn’t like the “men from the Ministry” – the all male world of a post-War Admiralty, and the spooks and the spies at work there – and it wasn’t until the narrative shifted to focus more on the fall out for Lily Callington and her family and friends that I really cared about any of the characters. You gradually learn that Lily was born in Germany to Jewish parents, and fled as a child with her mother to London. She’s buried that part of her life, and has lost all memory of the German language despite teaching French and Italian at a North London Girl’s school. Her husband, Simon Callington, is a lowly clerk at the Admiralty, who has a secret of his own from his Cambridge student days which ultimately enmeshes him in Cold War corruption.